How iOS 11 Save Huge Storage for You? Since the storage space on iPhone or iPad is limited, so running out of storage always be a headache issue for all iOS users. We all know that out of storage space always result in iPhone running slower and slower, or even crashing irregularly. So in the new version of iOS 11, Apple have tried to help iOS users to solve the out of storage issue, now, let’s to see how iOS 11 save huge storage space for you. How iOS 11 Frees Up Space on iPhone or iPad? It is no doubt that Apple have introduced a large amount of changes to the iOS 11 operating system, and one of these changes is a redesigned Storage Tools. With these tools, you can greatly deal with offload unused apps or data, and identify which items is taking up storage space and how to get rid of them in the best way. Now, we’ll discuss these updates one by one. Obviously, a chart listed on the top of the screen, and point out the breakdown of your storage by mail, apps, photos and other data. Then you can see recommendations for optimizing the storage plan. For example, you can view the large attachments in Messages and consider deleting them according to your own needs. And here is also a list of all apps and its size, so you can easily delete some apps that you have abandoned. What’s more important, you can get recommendation on how to free up space, such as uploading your entire photo library to iCloud, deleting “Recently Deleted” album permanently, auto deleting old conversations, reviewing and deleting personal videos and so on. After performing these recommendations, you can save a large amount of space on iPhone or iPad. This could be a great step for saving storage space on your device. When you have a look on the detailed info of an app, you can see a option of “Offload App”. What is the meaning? 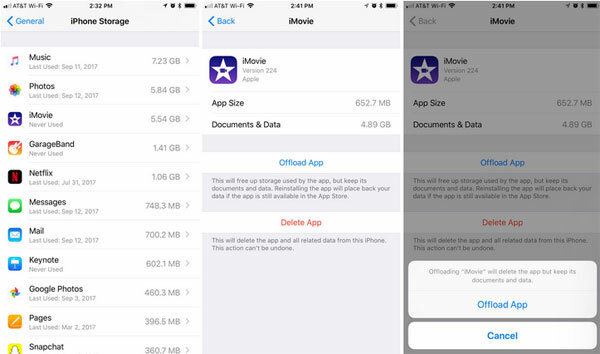 After choosing this option, that means you have allowed Apple to remove these “Offload App” from your iOS device when storage space is running low. Don’t worry, iOS 11 will save all of the data and documents related to the app, and when you need to use the app again, you can install it and get all data just like you never remove it. Please be noted that iOS 11 WILL ONLY remove the apps that you don’t use all that often, so if you like to download apps on iPhone but then never use them forever, this action will really help you free up space on your device without losing any data. iOS 11 has introduced a new image format as the default file format, which can offers better image quality than JPEG, but only in the half size of JPEG. Thus, the new image format can help you save almost 50% storage space on iPhone or iPad. However, since JPEG served as the web’s default image format for more than two decades, so you may find that the HEIF images are not supported by other devices. Then, you may need to convert HEIF to JPEG format to maintain compatibility. HEIF vs JPEG: What is the Difference? iCloud is a nice option to store iOS data, right? But we know that Apple only offers 5GB of free space to their users, which might not enough for your needs. So, Apple releases the iCloud storage plan to satisfy your additional storage needs. This time, iOS 11 has taken a new storage plan, which upgrade the space from 1TB to 2TB, while keeping the same price tag at $9.99 per month. 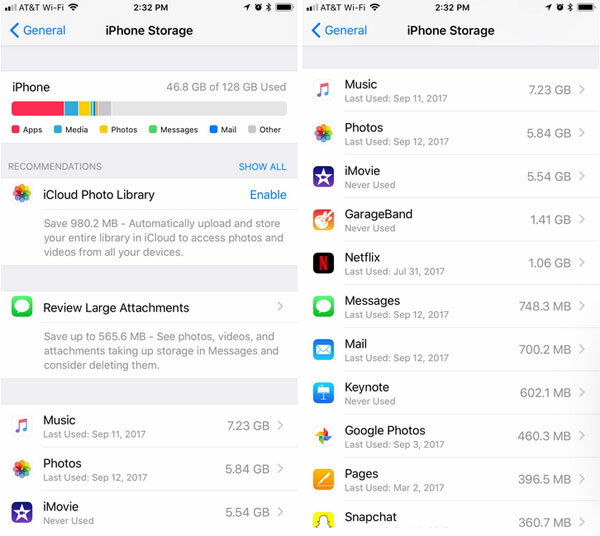 This is how iOS 11 save huge storage space for you, do you know how to free up space on your iPhone or iPad? We hope this article can help you solve limitation issue of your storage space and if you have any other practical solutions, welcome to discuss with us. The iOS 11 update is fine anyways, but just when it comes to my iPhone 7s it really is too much annoying…. This is a very common problem that faces by the user, I already have faced this problem with my apple product, but apple sort out this issue with the launch of ios 11, After i read this I feel relief that now I am saving my storage. We can save the storage of the ios phone to the Apple phone. From the settings also, we can check the remaining storage of the phone. We can save the photos, document to the online also to save the storage of the iPhone. Running out of storage space on your iPhone or iPad is a total drag. It slows down your device and can make it impossible to download files or perform other essential tasks. Space-hogging apps also can be removed on demand, without worries about deleting associated documents and data. iOS 11 brings new features that help us to avoid running out of storage on a device, And it gives flexibility If iCloud reach at storage limit then we can also buy more space. great website, thanks for all the tips! wishing you more and more success! Hi, friend! Thanks for your approval and I wish this post can be helpful for you. I will continue to update some related topics, please always follow my blog if necessary. When you can use an iOS-based device and you got an iTunes Error 4013 you can follow the instruction that may help to solve out your iPhone Based Error issue.